The Next Generation Internet enabled Wireless Electrical Switches and Dimmers. Smart Home products include switches, fan controllers, LPG leakage detectors, temperature and humidity monitors, smoke detectors, sensors and door locks. The products are designed for easy installation, usability and maintainability. The switches and dimmers fit into the existing modular electrical boxes and does not require any rewiring. The installation is simple and similar to classical electrical switches and can be installed by any qualified electrician. The switches are equipped with capacitive touch for manual operation. As there are no mechanical parts in the switches, the devices have a long life. Designed for replacing the classical switches and hence can be used for homes, offices, factories and hospitals, and can control any type of electric load including lights, equipment, appliances and machinery. The control units can be fitted with or without touch switches e.g. 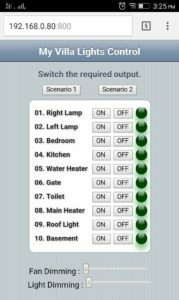 Controller can be hidden in ceiling or walls and control can be done only through mobile apps. Suitable for any type of electrical load.